Believe it or not, but the home I’m featuring today was once a “builder’s special with too much Sheetrock and not enough chic.” The home owners, a young Texas family with two pre-teen boys, hired designer Amanda Lindroth, and pow! 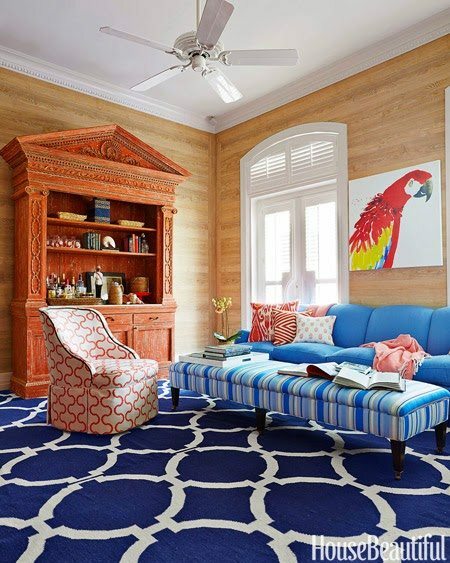 An injection of color, pattern, and seaside glamour brought it to life with a tropical punch. 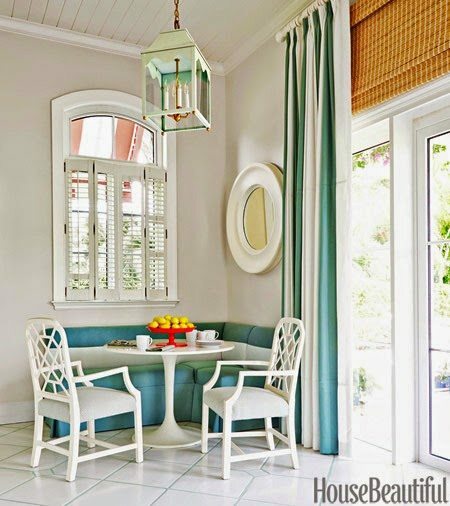 Let’s head over to Lyford Cay for a peek inside! The foyer steals the show inside. 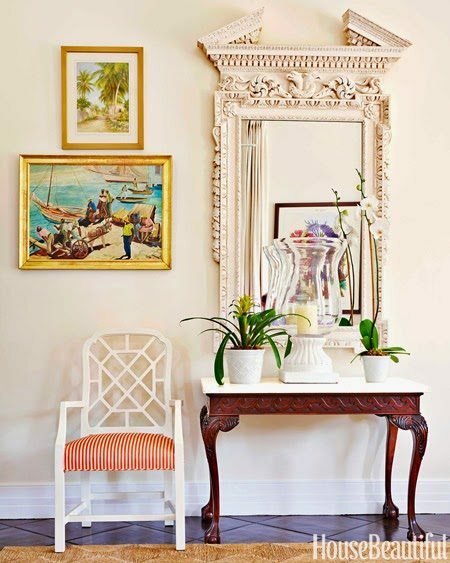 The trelliswork, mirror frame, and demilune table were designed by Philippe Le Manach of Accents of France and painted in Benjamin Moore’s Spring Break. 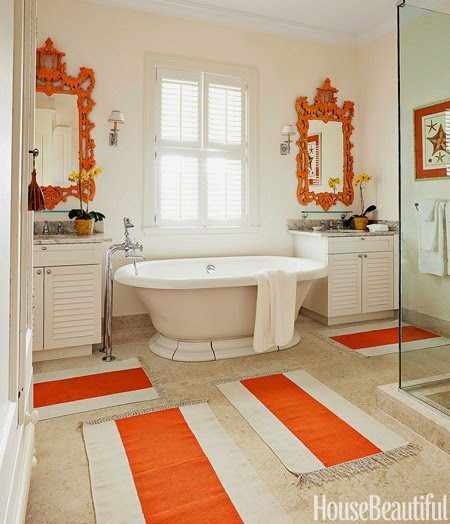 Ordinary terra-cotta floor tiles were painted in Decorators White and Bath Salts, both by Benjamin Moore. A backdrop of neutrals gives the living room a fresh, breezy air. Walls are painted in Benjamin Moore’s Atrium White. Slubby Basket cotton by P Kaufmann was used for curtains and to reupholster the existing sofa and armchairs. Lindroth loves stripes — and her client loves purple — so she had pillows made in Quadrille’s Lane Stripe, in a custom shade. Empire chairs from Bamboo & Rattan, with cushions in China Seas’ Turtle Batik. Serena & Lily Elsa side tables. Borobudur abaca rug, Stark. Seaview blinds. In the living room, a Kent mirror from Christopher Hodsoll hangs above a Georgian-style side table by English Georgian America. An upstairs TV room is dominated by a long sofa covered in Perennials’ Bigger Stripe. Walls are clad in Phillip Jeffries’s Driftwood grass cloth and trimmed with Samuel & Sons’ French grosgrain ribbon. Floor lamp, Visual Comfort. 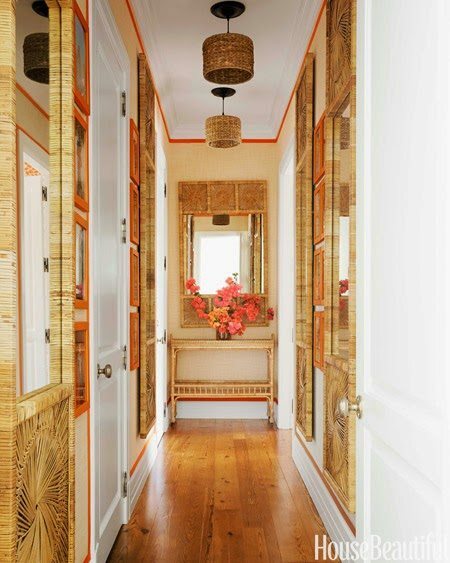 Vintage mirrors framed in stick rattan line the bedroom hallway, creating the illusion of windows. The large-scale pattern of faux-bois Chene wallpaper from Nobilis adds a rustic touch to the family room. A Ballard Designs banquette, Ikea Docksta table, and Circa Who fretwork chairs offer ample seating in the breakfast room. Stripes galore for the young boys’ bedroom: Phillip Jeffries’s Island Raffia wallcovering, Matouk bed linens, and Dash & Albert rugs. 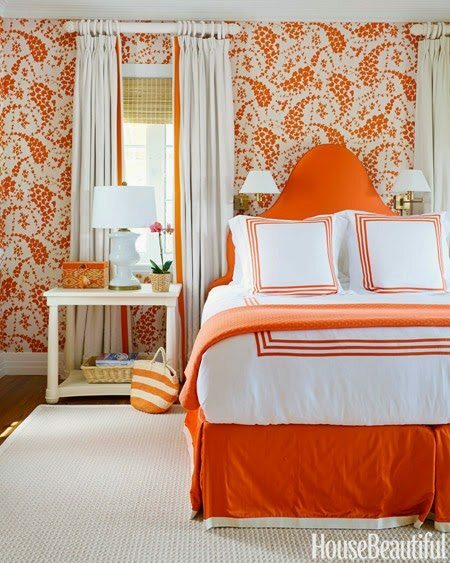 Spicy orange energizes the master bedroom. China Seas’ Lysette linen covers the walls, and the headboard is upholstered in a Norbar canvas. Meridian bed linens, Matouk. Hamilton table, Bunny Williams. Pagoda mirrors and Serena & Lily dhurries give “a little jolt” to the master bath. Kohler tub with Waterworks fittings. The veranda outside the bedrooms serves as an outdoor room. “It has a beautiful view of the entire property,” Lindroth says. 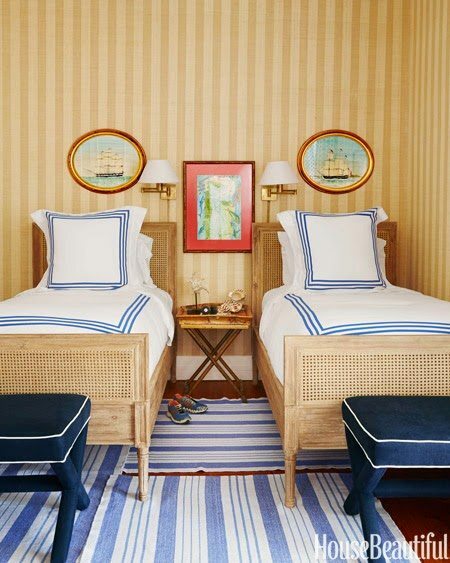 “And it’s a great place for the two young boys to take a nap on the vintage French daybeds.” The sea grass wingback armchairs are from Pottery Barn, and the kilim rugs are from Home Decorators Collection. 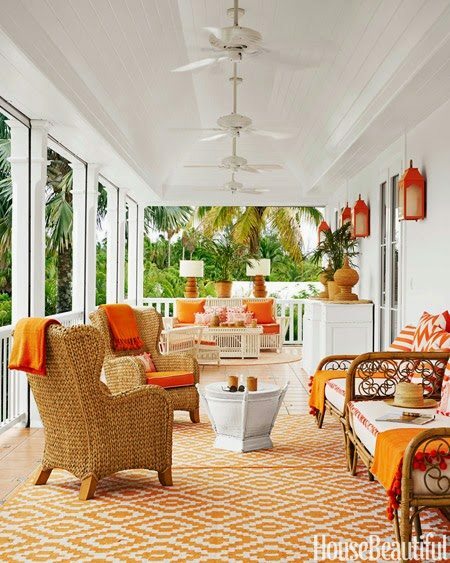 Hobe Sound lanterns by Oomph in Sherwin- Williams’s Knockout Orange. Ceiling fans, Nassau Glass Company. 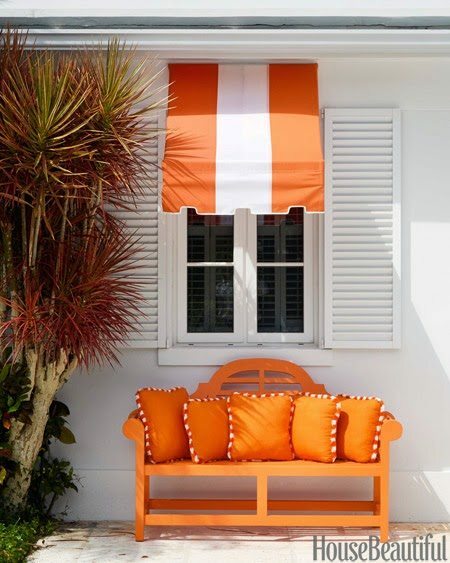 Lindroth gave the exterior “a showstopping personality” with big splashes of bold orange. Bench in Sherwin-Williams’s Knockout Orange. Pillows in a Link Outdoor canvas. Awning fabric, Sattler.Lush greenery provides privacy for the pool area.A twilight view of the double gallery side of the house, where Lindroth made full use of outdoor space. To learn more about this amazing transformation, click here for an interview with Amanda Lindroth. I would like to move right in, please! Images and captions are from the November issue of House Beautiful. Photography by Thomas Loof. This is absolutely stunning. Thanks again for a wonderful post! That first picture literally “took my breathe away” when I first saw it in House Beautiful and it still does. Thanks for putting it up so I can pin it, Andrea. Mind blowingly gorgeous! I can't get over those matching orange mirrors in the bathroom. Fabulous! love this jewelry! and her baby's nursery is TDF! thanks for sharing!!! Sign up for email delivery of new blog posts! Wood Countertops in the Kitchen: Yea or Nay? The Oldest House in Washington D.C. 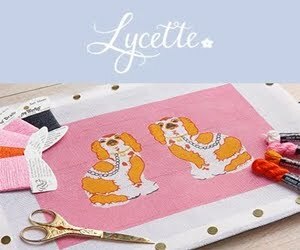 The Dorothy Draper Design Weekend! Has Blue and White Reached Saturation? A Previously Unpublished Mario Buatta Apartment! Lee Radziwill's Paris Apartment is for Sale! Happy Lily of the Valley Day! Grey Gardens is for Sale! Dream Nursery Sample Sale at AFK Furniture! Design Crush: Andrew Maier, Inc.
What will $899K Buy You in Natchez, Mississippi? What will $599K Buy You in High Point, North Carolina? HORCHOW SALE ALERT: 30% off Everything! What will $1.6M Buy You in Michigan? A Suellen Gregory Designed Home For Sale! Pretty Please... Pretty is Back! Another Ruthie Sommers House For Sale! It's National Wear Your Lilly Day! The Father of the Bride Home is for Sale! Bowood Chintz - and The Glam Pad - in Vogue! Amy Berry's Dallas Home for Sale! Carelton Varney for Frontgate + Giveaway! The Glam Pad Gets a Makeover! A Valentine from Carleton Varney: Signature Scarf Giveaway! Lettuce Ware Tureens by Tory Burch for Dodie Thayer Now Available! Jules Reid's Beach Bungalow for Sale! Jules Reid "The Princess of Prints"
The Lilly Pulitzer for Target Look Book is Live! A T. Keller Donovan Decorated Home Hits the Market in Palm Beach! Bananas for Lilly Pulitzer's Fall 2014 Collection! Another Jan Showers Home, Featured in Traditional Home, hits the MLS! The 2014 Palm Beach Red Cross Designers' Show House is for Sale! The Kennedy "Winter White House" is for Sale! $10 Mint Julep Cup Sale! Banana Leaf in Lady Gaga's NYC Apartment! Lilly Pulitzer Sale via Rue La La! Chintz is Back in Bloom! Guest Pinning at Lilly Pulitzer! The Lilly Pulitzer Estate Sale! Merry Christmas from The Glam Pad! Reader Home Tour: Inside Novara Way's Home! Celebrating One Year of Blogging! Lilly Pulitzer's Palm Beach Travel Guide! Art or Interior Decor Horror? Guest Posting at The Pink Pagoda! 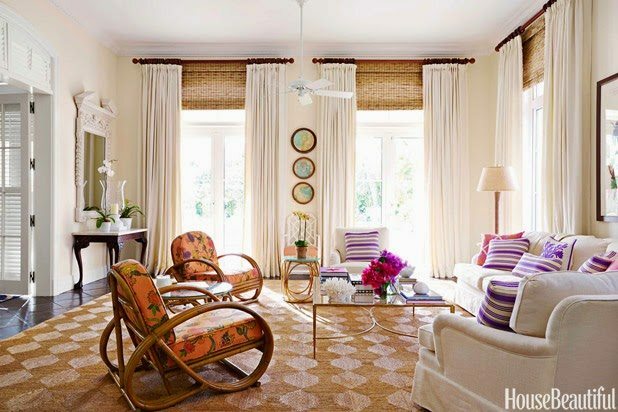 Reader Home Tours: Inside a Blog Reader’s Palm Beach Chic House! A Miles Redd Home Hits The MLS! Going Bananas for Banana Leaf! A Lilly Pulitzer Inspired Wedding! We Have New Windows and Doors!! Let's Flamingle with Dana Small! The Glam Pad Mentioned in Lonny Magazine! Oh, The Joys of Renovation! A Jan Showers Home Hits the MLS! Happy Glorious (and Glamorous) Easter! Palm Beach Chic With Scott Snyder, Inc.
A Roundup of Scalamandre Zebras! The Dorothy Draper School of Decorating: Back by popular demand! A Secret Island Getaway: The Gasparilla Inn, Boca Grande, Florida - A Tour with Mimi McMakin of Kemble Interiors, Inc.
FOUND: Vintage Thomasville Pagoda Headboard! The Glam Pad Celebrates One Month! A Carleton Varney Masterpiece, The Grand Hotel Takes You "Somewhere in Time"
De Gournay, In The Pink! All Hail Dorothy Draper, the Duchess of Decorating! 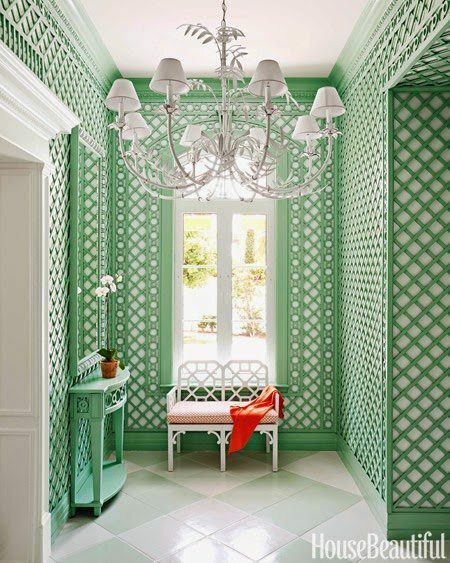 Circa Who Epitomizes Palm Beach Chic! Sign up for email delivery and never miss a post!